The Hosta Autumn Frost is a beautiful bright show stopper for your shaded, woodland areas. The blue green leaves with bright yellow margins fading to white in summer give this shade lover a changing look unusual for garden plants. This sport of First Frost Hosta is low growing at 1 to 1.5 feet tall and spread of 1.5 to 2 feet wide making it perfect for small yards or gardens with limited space. Autumn Frost Hosta is tolerant of heat, humidity and drought. This hardy Proven Winners hosta is tolerant of heavy shade and has shown tolerance of growing near and under Black Walnut trees. Lavender blooms pop up in July and August. 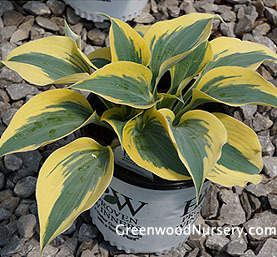 The Autumn Frost Hosta is sure to brighten up any shaded area of your yard. Autumn Frost ships in 1 gallon containers. Plants shipping to CA or AZ will be root washed before shipping.